When I was pregnant with my 2nd child, I had one secret fear that haunted me throughout my entire pregnancy. My entire heart already aches for 1 child, how on earth will it possible to love 2 in the same way? Does my heart compartmentalize and split into two, one for each child? Do I love them both equally and fairly? And what about my husband, where does he fit in? Whichever way I sliced it, it just felt like I was falling short everywhere, and leaving everyone unfulfilled. After really struggling with this fear for a while, I finally realized something. Something that I once knew but had somehow forgotten after becoming a parent--that the only way to love a person is with your whole heart. Therefore, a bigger family means a bigger heart. It seems like only yesterday when I was photographing Linda and Winston's growing family during their maternity shoot, when now big sister Emery was still a bun in the oven. 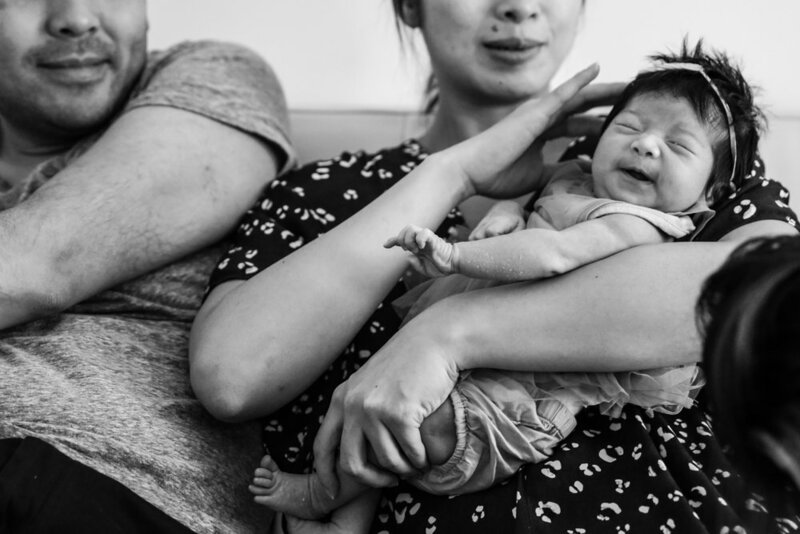 And when I came back for Emery's newborn shoot, I remember the feeling of tenderness of this new little family of 3, embarking on their newest adventure of parenthood within the span of 4 different NYC apartments. Now with their latest arrival of baby Willa, their beautiful family has grown again, which inevitably means their hearts have grown as well. And while the strain and stretching of a growing heart is not always comfortable and can sometimes be downright painful, I have found that the only thing I can do is to surrender to it and let it wash over myself. Because ultimately, a bigger heart beats stronger and has so much more love to give. So congratulations to this beautiful family of 4. The world is your oyster and I look forward to seeing what amazing adventures life has to offer you guys!